Two e-drawings from the past few weeks. The first drawn waiting for our friend to arrive at Canberra airport. 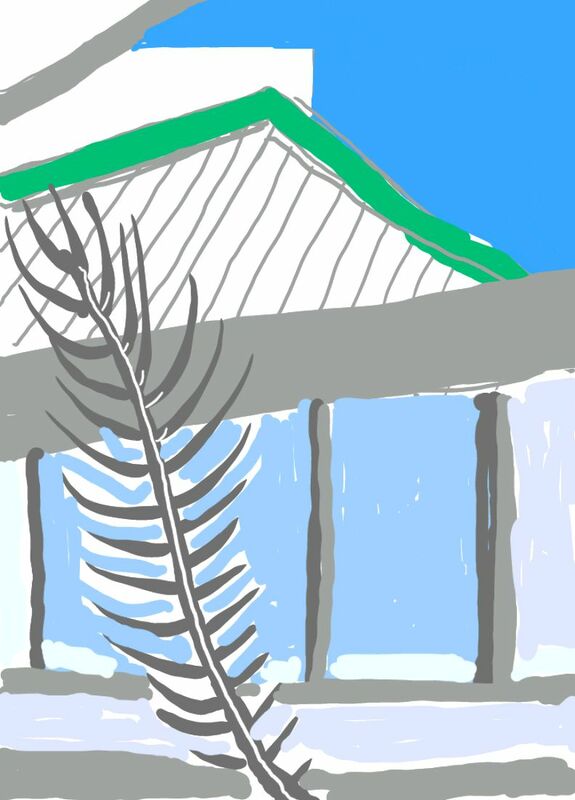 Part of the drawing includes the sculpture ‘Feather’ by New Zealand artist Virginia King. King says she was inspired by a lyrebird’s feather. Some what less inspirational was my wait at the physiotherapist’s. 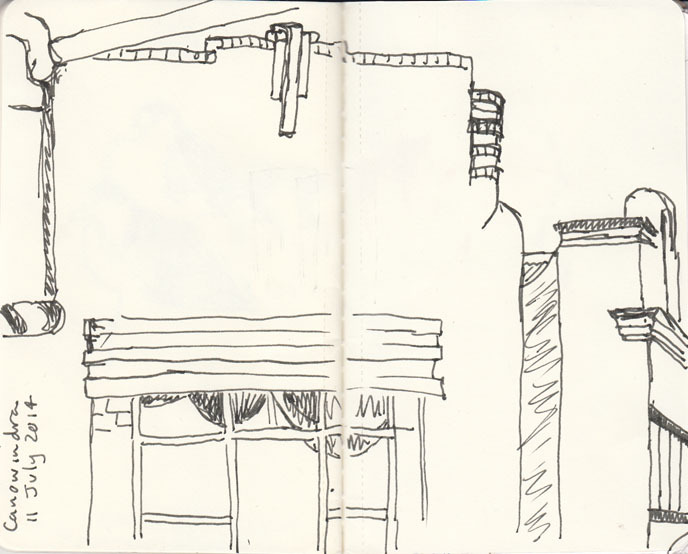 The outlook was out to the rather dour police station and the commercial buildings nearby. My eye was captured by the graphic sign for one of the building’s other occupants. On Saturday I had the opportunity to do a one day water colour class with artist Cherry Hood, winner of the 2002 Archibald Prize for her portrait of pianist Simon Tedeschi. 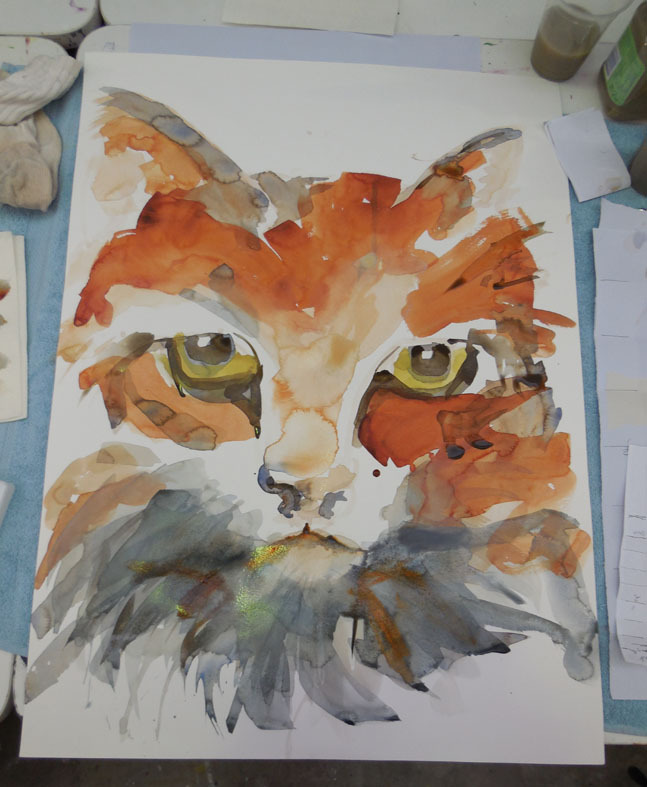 While Cherry primarily teaches portrait workshops, the focus of our class was drawing animals – this coincides with the Goulburn Regional Art Gallery’s current exhibition So Much More Than a Big Sheep. For non-locals, the city of Goulburn, in inland NSW has a history as a major centre of merino sheep / wool production. One of it’s most famous tourist ‘attractions’ is a very big concrete merino ram, known to all as Rambo. I had been rather slack and hadn’t checked out much about Cherry’s work prior to the workshop so when Cherry started talking about her gridding technique for transferring images I wasn’t sure that this was what I was interested in learning. I was soon proven wrong as her shorthand technique for image transfer avoided rulers and an overly tight technical approach. 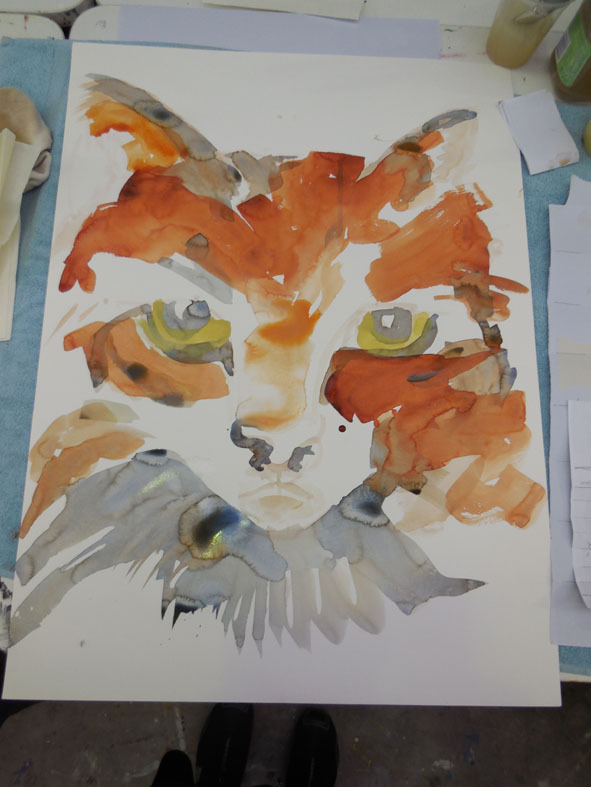 Rather she demonstrated how to transfer from the source material, a photograph, using a simple ratio approach, up to a full sheet of water colour paper. 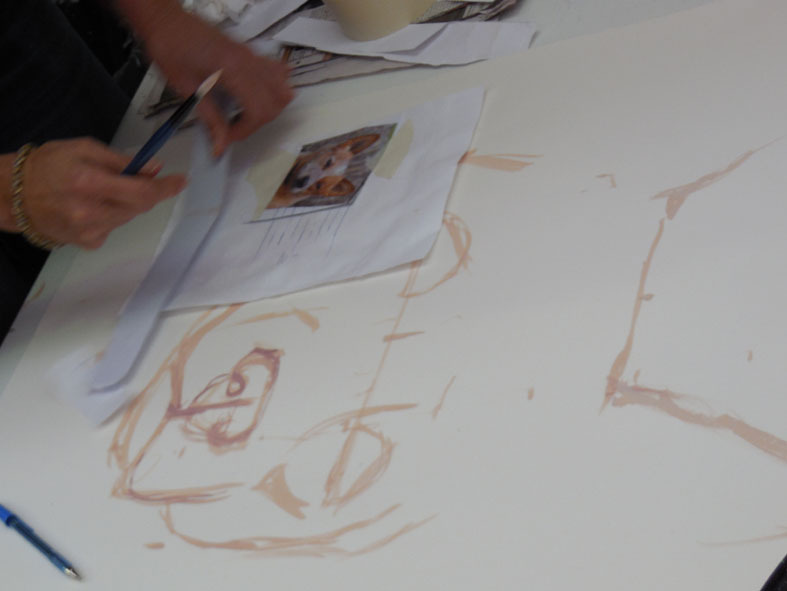 Drawing up an image into sections prior to transferring it to water colour paper. 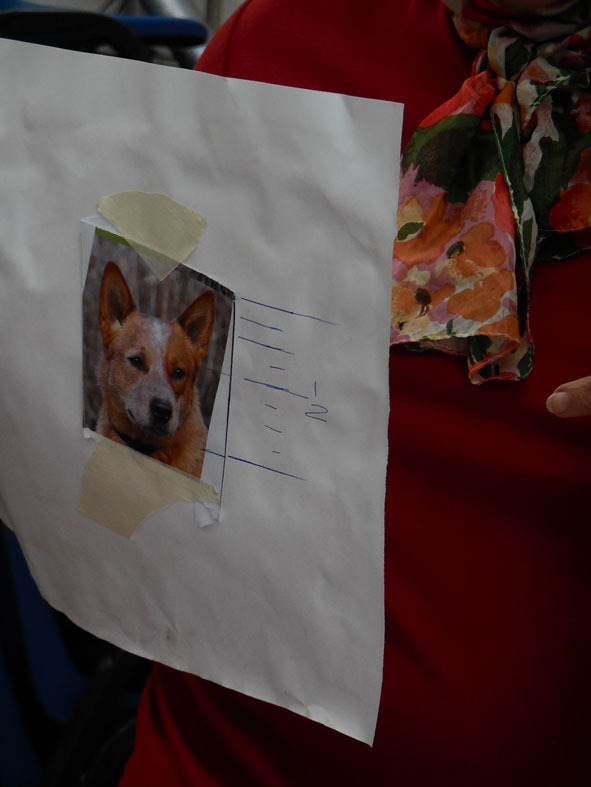 Once the features of the face to be drawn are located in the various sections they can be transferred to the larger sheet of paper, which has a corresponding number of sections located on it. A similar process is carried out for the width of the face. Cherry emphasised that it is important to measure the width of the face, animal or human, on the basis of the bone structure of the face, not the width of the fur or hair. It was interesting to see that the relative position of features such as eyes on animal faces is the same as for humans. So now I know that my in my dodgy dog drawing of the other week I had placed the poor animal’s eyes way too high on the head. Cherry Hood demonstrating working from her source material and the full sized sheet with key features sketch-painted in. 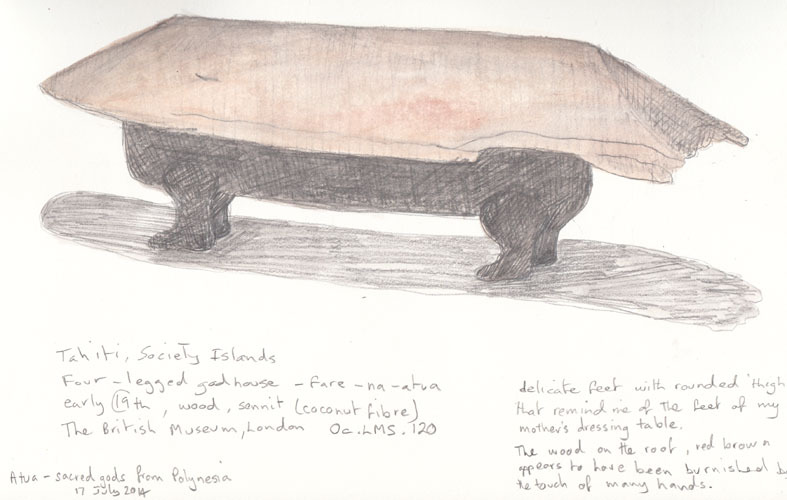 The key features of the subject are marked on the large sheet of paper with a mix of titanium white, tinted with some of the dominant colour of the animals fur. The idea is that these marks are covered by subsequent painting and / or lifting out of any obvious remaining marks. Cherry adds the final colour by way of large washes with wide flat nylon brushes she buys at the ‘$2 shop’. She carefully manages her edges, keeping them wet with a spray bottle or brushing vigourously to avoid hard edges, which gives a more realistic impression of fur. She is happy for blooms of paint to occur and does final emphasis with fine brushes once the work starts to dry. The final version of Cherry’s painting, before it has fully dried. 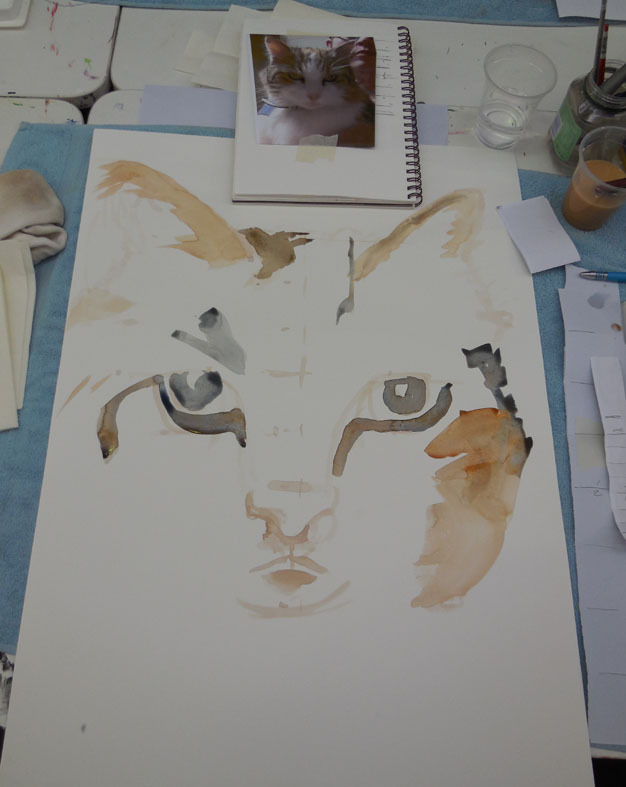 I was painting an image of my cat, which you can see at the top of my sheet of paper. This was my second go at the painting as where I had originally placed my cat’s head on the paper was well off-centre. Thankfully I could just flip the sheet over and start again (the paper is a full sheet of Cotman cold-pressed 300 gsm water colour paper). Early stages of painting with some of the underpainted location marks visible. Here is the middle stage of the work. At this point I was pretty happy with the upper part of the painting, but I was struggling with the lower part of the face. 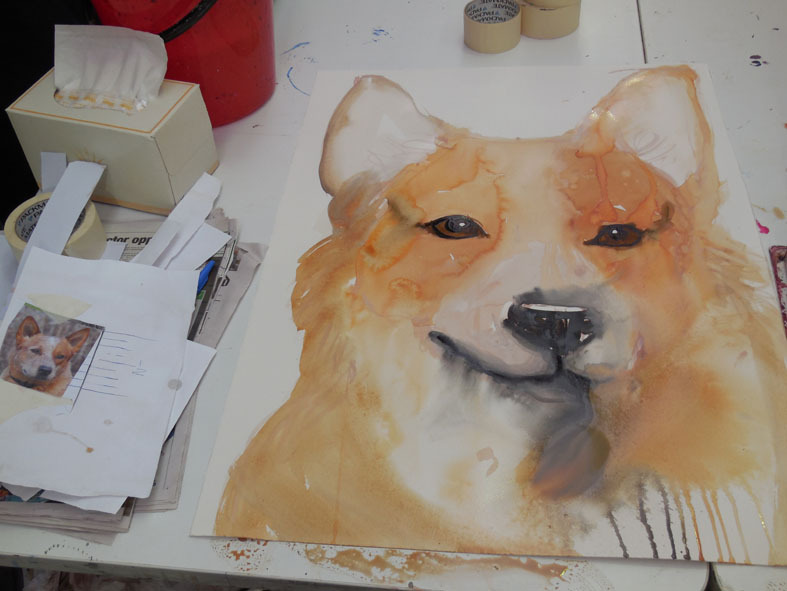 In the middle stages of my painting the basic colour washes have been added. I subsequently realised that I had forgotten to locate how wide my cat’s lower face was, hence I washed in a chin that was way too narrow. This is definitely my cat when I look at those eyes! Final emphasis is in place. (The odd colour on the chin is actually a reflection off the wet paint not accurate colour). In the end I did manage to bring back a chin more in keeping with how my cat actually looks, but as my partner somewhat cuttlingly observed, “our cat doesn’t have a pantomime beard”. I’m really pleased with how the eyes have worked out and I can definitely see my cat looking out at me. Now I’m off for some more practice. Maybe its a sign of advancing age, but I found myself rather saddened by the display of sacred Polynesian images and objects (atua) in the latest exhibition at the National Gallery of Australia. The quality of the work was so high and as a textile artist I was very impressed by the very finely woven and plaited coconut fibre used in many works. But… Each atua sat on it’s little plinth, mostly is glass boxes, arranged by island group in a sad mockery of the vast Pacific Ocean they came from. While I was in awe of the carving skills displayed in these atua I just kept thinking that they wanted only to be returned to their marae (sacred enclosures). I struggled to feel comfortable drawing them, which was why I went to the exhibition in the first place. In the end I made these two sketches. The atua Tu, from the island of Mainaragi, before 1834. Tu was the atua responsible for the island’s main food source, the breadfruit. 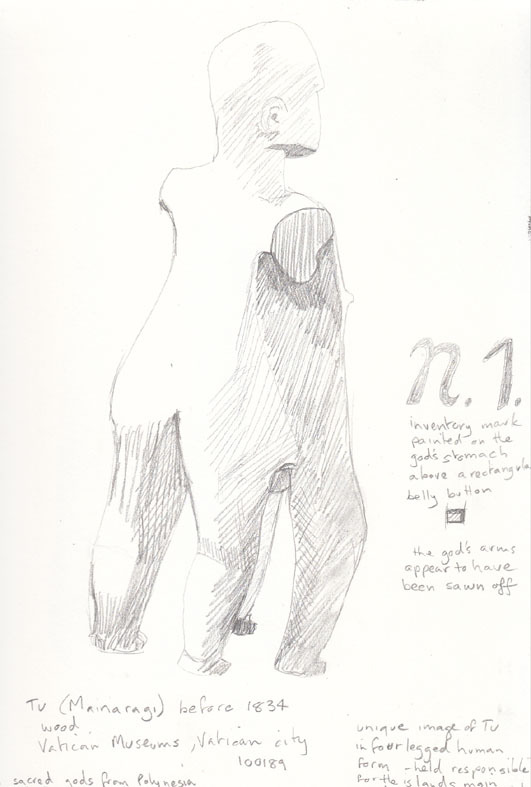 The large N1 on my page is, what I assume to be an inventory mark painted on the atua’s stomach. This piece is in the collection of the Vatican Museum. I think it is a horrible thing that this sacred image is held by a religious organisation that was/is antipathetical to the island’s religions. Fare-no-atua (a god house), Tahiti, early 19th century, wood and coconut fibre. I loved seeing the burnished surface of the wood of this piece. It looked as though many hands had touched it’s surface over a long period of time. This piece is in the collection of the British Museum. I added the colour after I left the gallery. Last weekend we drove to the Central West of New South Wales to celebrate a family birthday. Along the way we had the opportunity to pass through some interesting small country towns. Our first stop was Canowindra, with it’s dogleg main street. While the majority of the buildings date from the late 19th century, I noticed this Art Deco influenced brick building, at one end of the street. It abuts, on the right hand side, one of the more typical buildings along this road. These buildings have decorative facades in front of utilitarian brick and timber structures, in this case with a corrugated iron roof. On our return journey we stopped in Boorowa where European settlers first took up land, (ie nicked it from the local Aboriginal mob), in 1828. We had lunch under the spreading verandah of the Boorowa Hotel, built in 1880. Diagonally across the road I could see the Court House, built in 1860 in the classical style, which is typical of government buildings in this era. Next to the building stands a large Bunya Pine (Arucaria bidwillii). These majestic trees, native to the state of Queensland have been widely planted as ornamental specimens in other parts of the country. 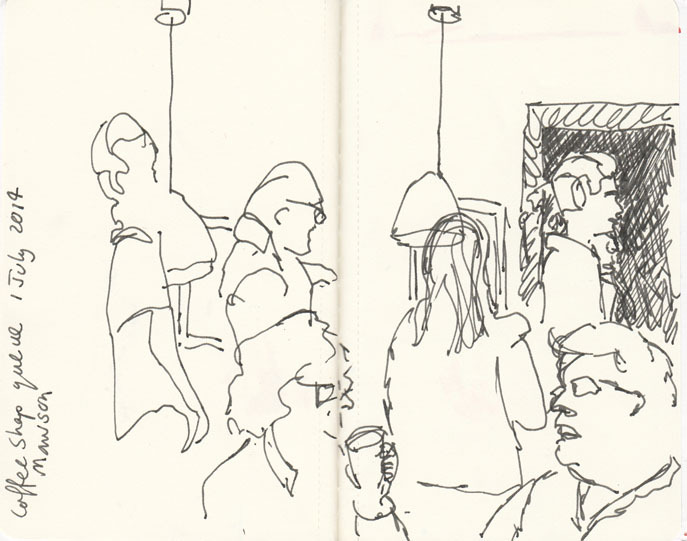 Continuing on with the catch-up, there were opportunities to draw at two of our regular coffee shops last week. 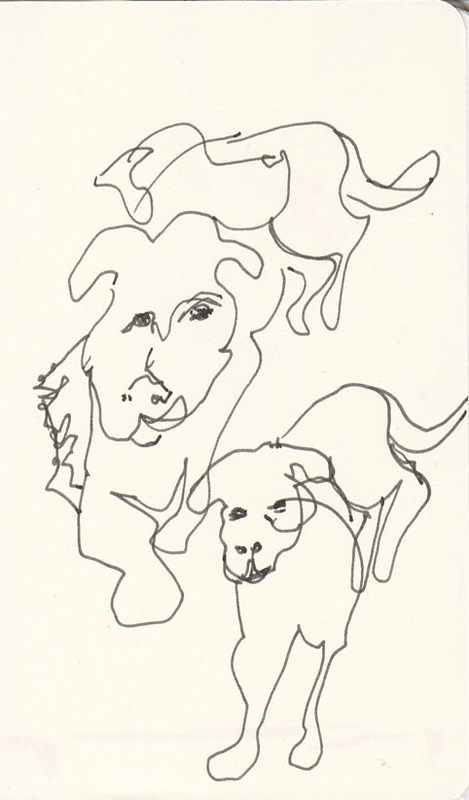 The next day I attempted to draw this dog waiting for it’s owner. While I’m OK with the position of the body, getting the dog’s head the way I wanted really eluded me. I suspect that I’ve not looked closely enough at the relationship between the position of the animal’s eyes and ears. No doubt there will be plenty more dogs I can draw in future. Later in the week we once again took to our bikes to ride around the lake. 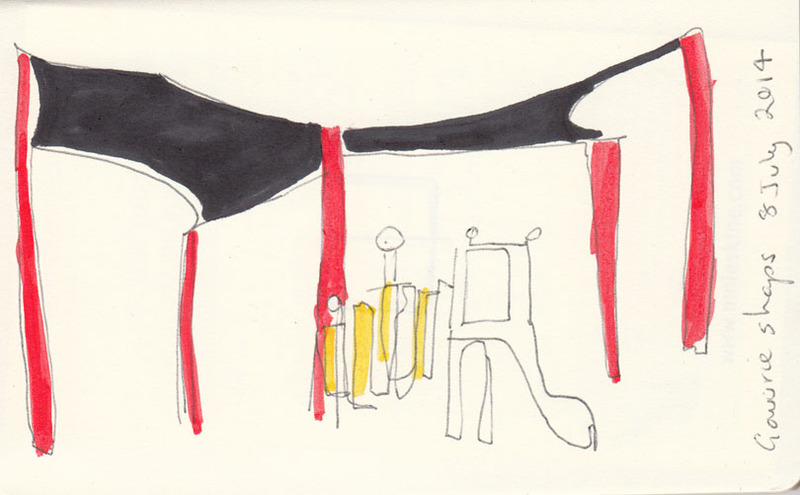 This time I was ready with all my gear to sketch the swan and or any other nearby waterbirds. But nature isn’t always obliging and we saw nary a swan. The wind was blowing a howling gale so finding a spot to sit without being blown into the water was hard enough. 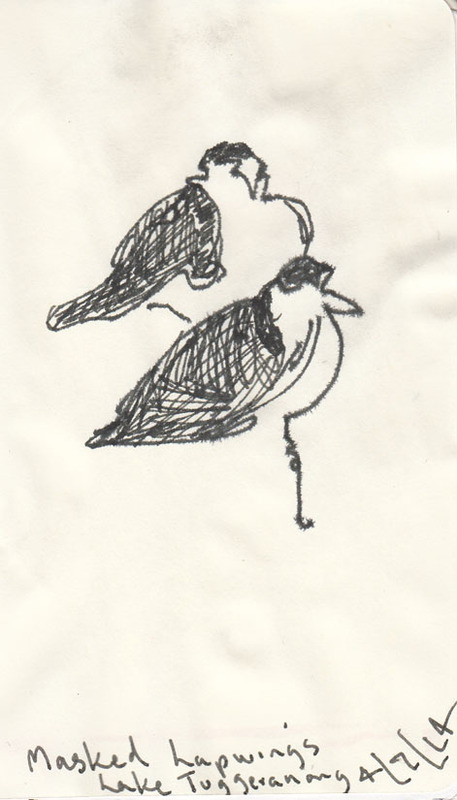 I did manage to draw two Masked Lapwings that briefly landed near where we were having lunch. 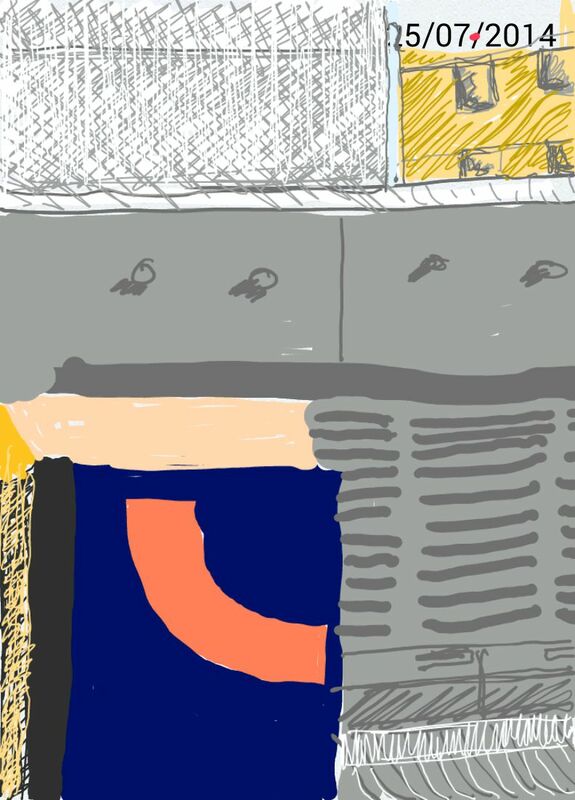 As I was simultaneously trying to complete a painting of part of the nearby pontoon I decided to dampen my paper to see how it would work. I like the quality of the resulting line quite a bit. I ended up having to abandon trying to paint as the wind shifted and we couldn’t bear to be sitting still any longer. 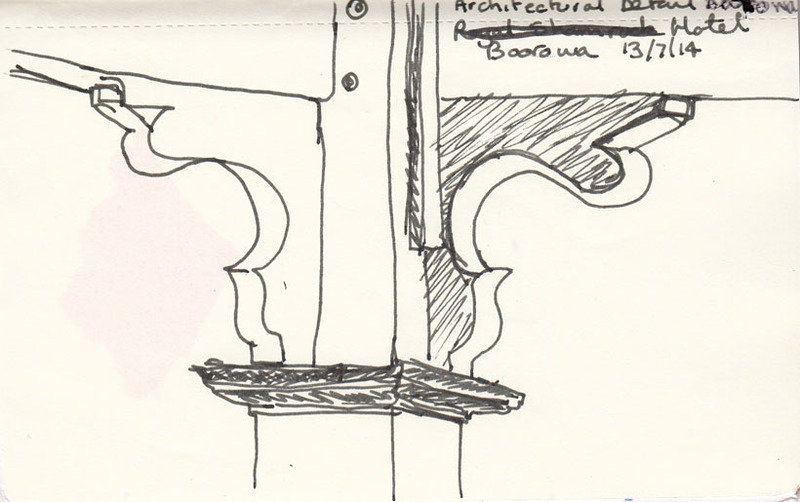 This week I’ve managed one cafe drawing, at a new locale, which I’m sure will offer more drawing possibilities. Unfortunately I was distracted by sitting on an icy metal cafe chair, outside, because the cafe was full, waiting for the fog to lift. Cold winter mornings are not conducive to making detailed drawings! I added the colour after I got home. 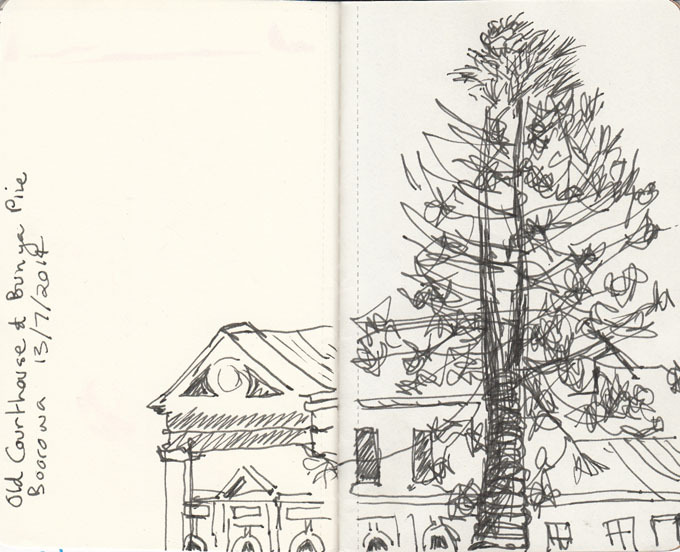 Looking back at my small sketchbook today I realised that I haven’t posted any drawings from the last two weeks. So here goes. On 30 June after a weekend of vile wet and cold weather we finally had a clear day. Suffering from mild cabin fever we took the opportunity to walk along the fire trails on the lower slopes of Mt Taylor, part of the Canberra Nature Parks reserve system. The main reason was to get a view of the snowfalls on the Brindabella Ranges (please excuse the dodgy panorama which I stitched together in Photoshop rather than with a special program). Snow on the Brindabella Ranges, 30 June 2014. The fire trail also runs beneath the powerlines. I quite liked the looping repetition of the lines. 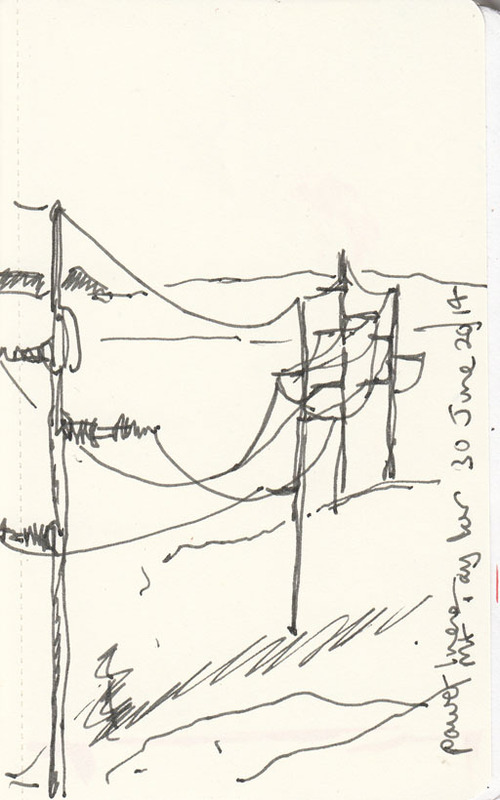 Powerlines on Mt Taylor, pen and ink, 30 June 2014. As I finished this sketch I became aware that I was being watched by two locals, a female Eastern Grey kangaroo and her joey. 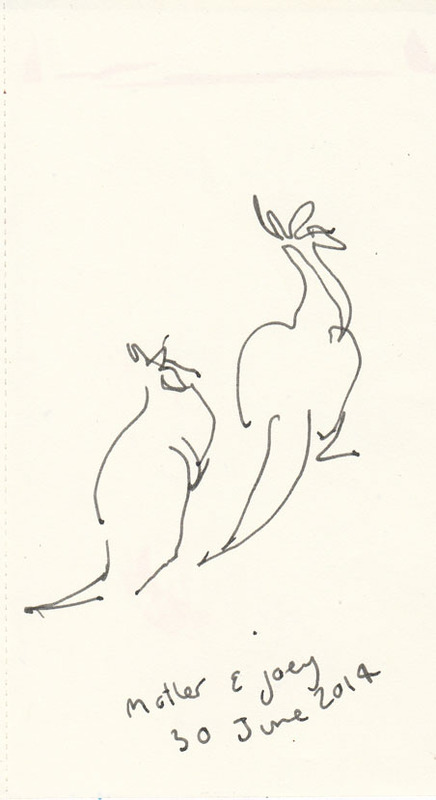 Eastern Grey kangaroos, pen and ink, Mt Taylor, 30 June 2014. At the bottom of the fire trail we came across evidence of other artist’s in the area. Someone, some many, had been making Goldsworthian interventions in the bush. Good to see. 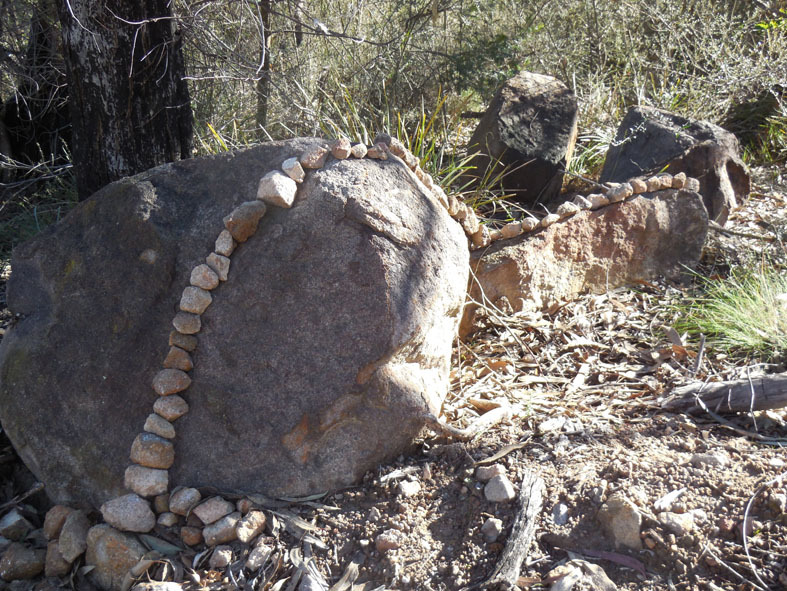 (BTW the small rocks come from the fill put on the fire trails for maintenance, they haven’t been taken from the bushland). A ‘Goldsworthian’ intervention on the lower slopes of Mt Taylor, 30 June 2014.